note to self: clean up this space! Today was a boring day for blog readers, but busy day for me as an artist. This is the totally uninteresting, unglamorous part of being an artist. I had ordered a bunch of gessobords awhile back. So today was spent underpainting a bunch of them, both the panel itself and the 2" cradles (sides). They were done in an orangey color. My paintings never start on the white background. Then I painted some of the finished paintings sides black...no frames needed. 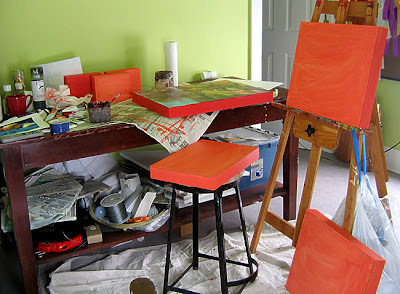 Then, I set up a whole mess of different still lifes and took a bunch of pictures. I may have gotten 2 or three good images (or interesting anyway) out of 50 set ups. So, those will have to be edited and played with before they even start getting near a painting surface. Also, most of Sunday afternoon and part of this morning was spent adding to my mailing list and art records on the computer. I recently purchased eArtist as my database software. So far, so good, but this requires a bit of discipline of sitting down a certain time each week and logging in all that stuff. This week is going to be a ball-buster (and that's saying something since I'm a girl). Our restaurant is VERY busy this coming Valentine's Day, we also have b&b rooms on and off all week. At my other job, Affinity AV, we are finishing up one big website client and will be training some of their folks on the new site, and then we start on our biggest website ever. The Art 4 Art's Sake fundraiser is coming soon, and being on the committee, we have a big meeting tomorrow night to get all the final details locked in, and then on to the Y for a workout...much needed I might add. I'm feeling that over wrought feeling again. Truly hate that feeling because it makes me a little bit bitchy.